The Topps Holiday program is back Sports Cards Plus, giving collectors a chance to get exclusive cards, including parallels and autographs of top players. 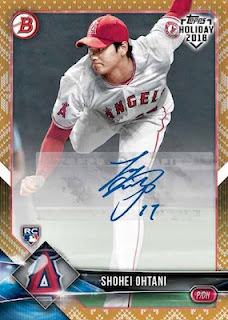 The Topps Holiday program is back again in this season, giving collectors another reason to head to their local hobby store. The holidays hold a special place in our hearts as it is time to spend with family and friends – and what better way to enjoy that time than with trading cards. To take part in the 2018 Topps Holiday program, head to Sports Cards Plus, a.k.a. The Super Hit Factory starting Friday, November 16, purchase $10 or more of Topps products and get a free 2018 Topps Holiday pack that contains three cards in the 2018 Bowman Baseball design, while supplies last. 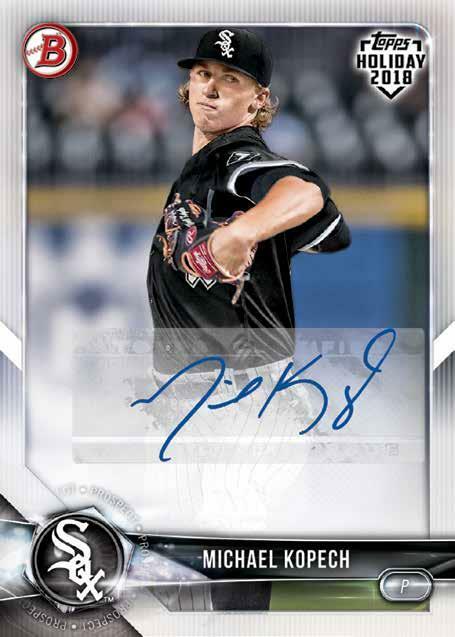 The autographed cards will also have parallels with Turkey and Gold Festive. There are 100 players on the checklist, including Shohei Ohtani, Aaron Judge, Ronald Acuna Jr., Alex Bregman, and prospects Vladimir Guerrero Jr., Fernando Tatis Jr., and Hunter Greene. PARALLEL CARDS: Turkey #'d, Gold Festive 1/1.